What should be the new administration’s top priority related to older adults? Experts react to the growing use of probiotics in older adults. Could it be the newest boon to elder intestinal health? When mental illness occurs in the early stages of Alzheimer’s disease, appropriate treatment can often improve cognitive function. But co-occurring mental illness must first be recognized and diagnosed. The population increase among ethnic older adults has prompted research on ways to improve care for our country’s culturally diverse elders. Practitioners can enhance communications to improve care delivery across ethnic groups. Lifestyle changes have proven effective for reducing the odds of developing late-onset type 2 diabetes, a disease with catastrophic physical and financial consequences. In print and online and specific to your field! Facilities from all over the country place ads in Aging Well to find professionals like you! 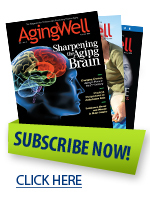 When searching for your next job, check out the career opportunities section in the pages of Aging Well magazine and visit the Aging Well Online Job Bank, located at www.AlliedHealthcareers.com. It’s difficult to estimate the number of elders given to hoarding items such as clothing, newspapers, or even junk. But experts agree it’s a very real problem involving older adults who, for various reasons, are unable to part with their possessions. Hoarding behavior not only contributes to elders’ isolation from family and friends, but it also creates an ominous safety hazard in their homes. In this month’s Field Notes, aging experts contend that standardized rating systems for U.S. nursing homes frequently fail to paint an accurate picture of their operations, and research suggests that estrogen may stimulate a gene that influences a specific, more aggressive type of prostate cancer that is hormone sensitive. Imagine a dwelling piled floor to ceiling with trash and garbage to the extent that it’s possible to navigate from room to room only through a series of tunnels carved through the debris. Inconceivable? Difficult as it may be to envision, such living conditions exist—and likely more extensively than we realize. In fact, this scenario characterizes precisely the way a 74-year-old man met his demise in England in early January, according to the Daily Telegraph. When neighbors expressed concern about not having seen their aging friend for several days, police forcibly entered the man’s home. The scene they encountered personified hoarding at its most frightening extremes. A specialty search and recovery team was required to locate the body of the eccentric man who apparently died of dehydration amid the cardboard boxes and litter that made it a challenge to move around within the house, according to the newspaper account. The occupant’s disorientation likely had prevented him from satisfying his own basic needs. Although the nursing home quality rating system has several dimensions, experts say it fails to address what may be the most important question: Are the residents who live there happy? When choosing a nursing home, Kansas State University aging experts suggest visiting the facility in the morning. If some of the residents are still sleeping while others are eating breakfast, that’s a sign that they’re determining their own schedules rather than doing what’s easiest for staff, says Gayle Doll, PhD, director of Kansas State’s Center on Aging. She and fellow researchers at the center say that government ratings like the five-star system instituted by the Centers for Medicare & Medicaid Services don’t necessarily reward nursing homes for offering a homelike setting and giving residents as much freedom as possible. I’m an occupational therapist enrolled in a professional geriatric care management certificate program. As a geriatric care manager, can a screening tool that is generally used by occupational therapists, such as the Allens Cognitive Level screen, be used during a client’s assessment? Should it then be referenced in the client’s assessment/plan of care as a tool incorporated in the evaluation based on the geriatric care manager’s professional background as an occupational therapist? There are several issues here. It is wonderful that you’re taking advantage of additional training because the work of a geriatric care manager is very different from the work of an occupational therapist. Having a degree in occupational therapy will be a wonderful asset for your care management clients because you will possess a skill set from which many older adults can benefit. Of course you could use an occupational therapy assessment—the more information you have available, the better. You should explain in your assessment (as well as in your bio) that this is a tool you have been trained to use as a licensed occupational therapist (if you are licensed); otherwise, you could say as an experienced occupational therapist. — Irene Zelterman, LCSW, C-ASWCM, is the founder and executive director of Hearthside Care Coordinators care management agency in Brooklyn, NY, which serves the New York City metropolitan area.